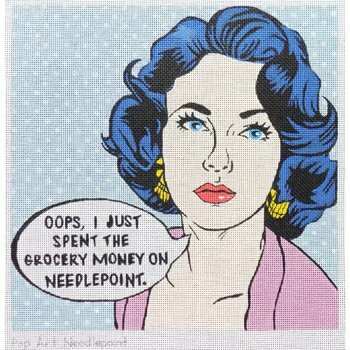 Opps, I just spent the grocery money on needlepoint is a hand-painted needlepoint design onto 13 mesh needlepoint canvas. The design area measures 12" x 12"
You can purchase this needlepoint as canvas only or with your choice of cotton floss, wool (Planet Earth) or silk (Planet Earth). If you want to stitch this canvas on stretcher bars we recommend two pairs of 16" with thumbtacks. Contact us with questions about any art and unique needlepoint design.